In the second half of January I had two brief 30hr visits to Beijing. I always find it remarkable how the old Peking is a city of extremes... Temperatures often climb above 40C in the summer months, while they dropped to -20C the first night I was there. In the afternoon I made my way to the" Beijing camera equipment city". A one hour metro ride from my hotel followed by a 20 min walk brought me to a large complex full of official camera stores. No fake stuff here! Everything comes with international warranty. 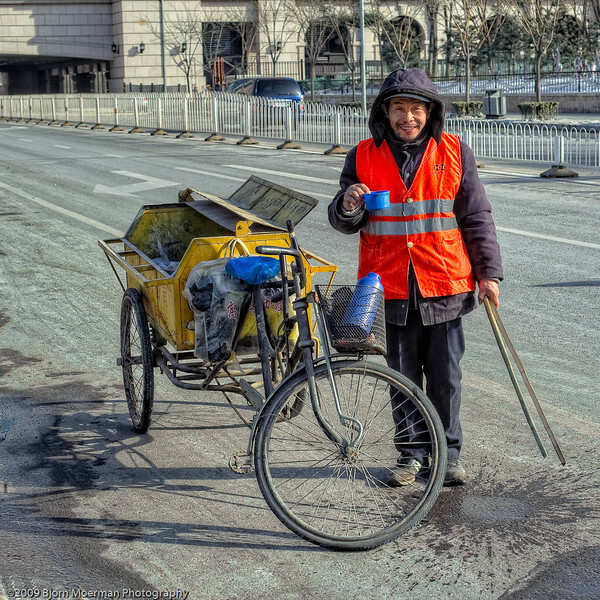 Just before entering the center, I had a brief chat with a very friendly Beijing street cleaner... Well chat? He didn't speak any English and my Mandarin is limited to Niihau (Hello) and Xie Xie (Thank you). Using sign language, I asked him whether I could take his picture. He smiled and approved. Interesting enough he collects the garbage with two large chopsticks. Very Chinese if you ask me! I do like the shot but wished the blue car in the background was not there. Next time better! By the way, I couldn't resist and left the place with a brand new Nikkor 70-200 2.8 VRII lens. Meanwhile I sold my "old" (18months) 70-200 2.8. VR lens in Dubai. More on this exciting lens shortly! Just back from spending 30 hrs in Rome, Italy. I've been to the capital of Italy multiple times and this time decided to go for a photo walk off the beaten path. Basically wherever the tourists were turning left, I took a right and vice versa... Admittedly I did finish with two of the most iconic monuments of Rome, "the Spanish steps" ( PIaza di Spagna) and the "Trevi fountain" (Fontana di Trevi). 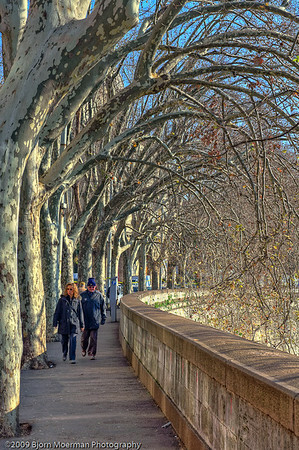 Initially I started the beautiful cold winter morning walk by crossing the Tiber river and strolling along its west bank which beside the Vatican has very few tourists. While the Police seems to be chasing away the homeless from the centre... 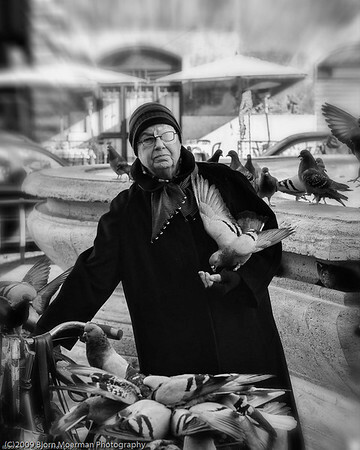 I bumped into the household of this older Italian, living around the Isola Tiberina area. 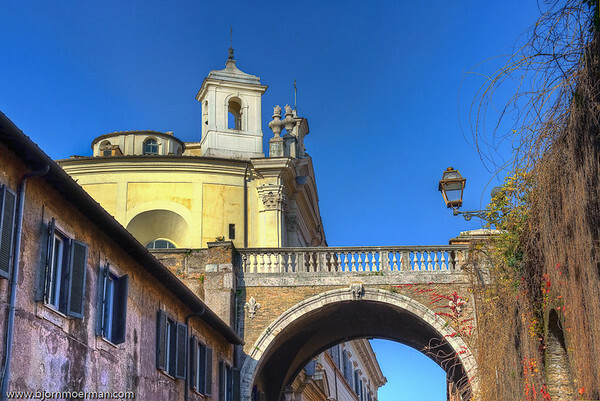 Continuing up North, I followed the Via Giullia which leads to a nice arch, called "L'Archo Farnese". I had seen a Google Earth photo of the bridge where it's fully covered by beautiful hanging greenery. Unfortunately most of the plants seem to be gone this time of the year. Nevertheless I'm still quite happy with the High Dynamic Range (HDR) image above which highlights the structure. Meanwhile behind me a dog was patiently waiting for his boss to come out of this coffee shop. There seems to be a constant lack of parking space in Rome. 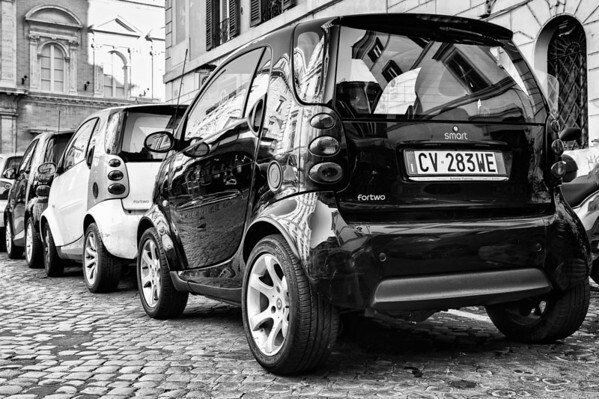 The Smart fortwo is therefore very common. Three of them in a row made for a nice photo opportunity. 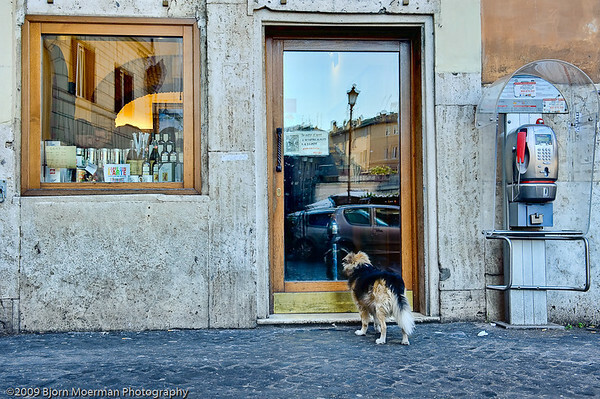 More of my Rome photography can be found by clicking on any of the photos above. 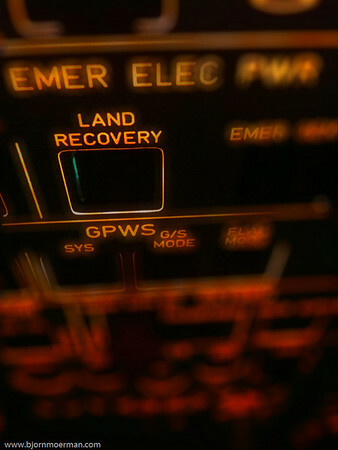 Without going into too much detail, I can tell you it has to do with recovering some systems in case of a loss of all electrical generators. So... no big deal! More iPhone images in my iSee gallery. May 2010 bring you joy and happiness!!! 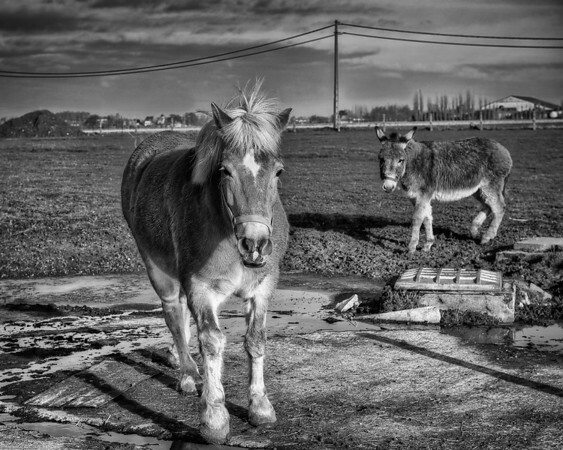 My number 1 Photography resolution for 2010 is a new personal project called: "Pic(k) of the week". Each week I will pick a pic(ture) from my own library and write a small blogpost about it. Ideally this will be a picture shot during the specific week. If that is not possible, I will pick a pic that somehow resonated with me during the week. "Knotwilg Avenue", my first pic(k) of the week, was shot in Vinderhoute near Ghent (Belgium) on a cold and wintery morning after some night snowfall. Needless to say that the official name of the street is not Knotwilg Avenue for the curious ones, it's called "Molenslag". Knotwilg trees are common in Belgian landscapes.